HOUSTON (CN) – With Lockheed Martin in the crosshairs of a whistleblower who claims its fighter-jet program defrauded the United States of more than $50 million, attorneys for the defense giant urged a Fifth Circuit panel Tuesday to affirm a lower court’s dismissal of the case. The Maryland-based company won the contract in 2001 and the Pentagon promptly put its first order in for 3,000 F-35 Lightning II jets. The aircraft are built with stealth technology for bombing and strafing ground targets and reconnaissance. 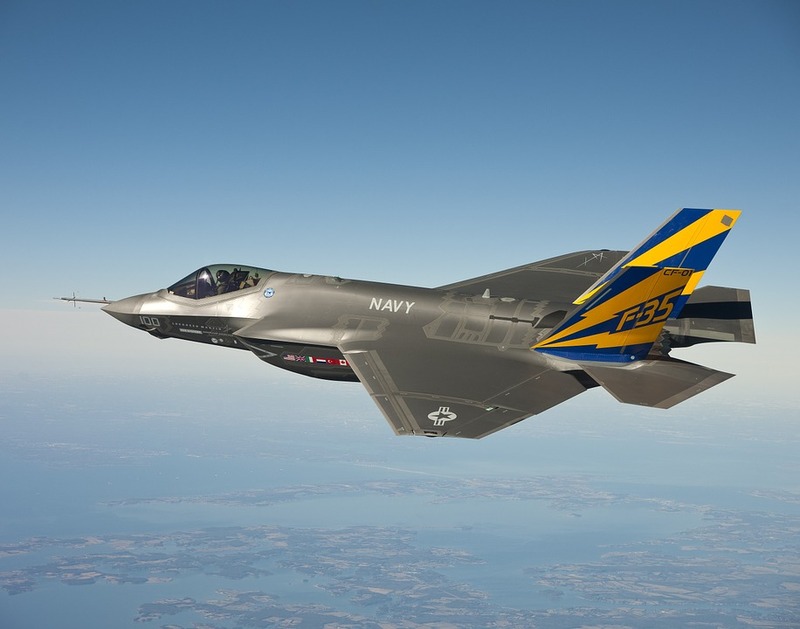 Lockheed Martin hired fellow defense contractor Northrop Grumman Systems Corp. to install communication and navigation systems in the jets as part of the government’s F-35 Joint Strike Fighter Air System Program. The Pentagon’s most expensive weapons program, it churns out jets for the U.S. military and to sell to U.S. allies the United Kingdom, Italy, Netherlands, Australia, Canada, Turkey, Israel and Japan. The would-be-whistleblower Paul Solomon worked for Northrop from 1976 to 2008 and audited its F-35 subcontract from December 2005 to September 2007, according to his November 2012 lawsuit. Solomon says in the whistleblower complaint that he discovered Lockheed and Northrop were “concealing from the government the true cost overruns of the JSF Project” and reported his findings to the Defense Department’s Defense Contract Management Agency, or DCMA. His attorney Bruce Howard told the Fifth Circuit on Tuesday that although the DCMA brought in five other federal agencies to help look into Solomon’s claims, they didn’t turn up any evidence of fraud, concluding only that Lockheed Martin was noncompliant with the contract through its use of management reserve funds, strictly designated for unexpected costs, to cover cost overruns. Howard said that after Northrop removed Solomon from the program in August 2007, Solomon filed an in-house ethics complaint with Northrop because he didn’t feel the noncompliance issues were being adequately addressed, leading to the discovery of a memo he claims proves the defense contractors set out to defraud the government. Howard said the January 2005 memo documents an agreement between Northrop and Lockheed to purposely understate Northrop’s estimated cost to complete the contract by $233 million. The government declined in October 2014 to intervene in Solomon’s lawsuit, in which he accuses Lockheed and Northrop of violating the False Claims Act. False Claims Act litigants can sue for the government and be rewarded up to 25 percent of any settlement if the government intervenes, and up to 30 percent if the government decides not to, though success rates greatly improve when Uncle Sam signs on as a co-plaintiff. U.S. District Judge Sidney Fitzwater dismissed the lawsuit with prejudice in December 2016, finding the “public disclosure bar” precludes Solomon’s claims. Fitzwater held that Solomon’s reports to the DCMA did not qualify him as a False Claims Act whisteblower because his job required him to report the alleged fraud, and that his claims were based on public records – a November 2007 DCMA report and a March 2008 report from the Government Accountability Office on Lockheed and Northrop’s mismanagement of the contract funds. But at Tuesday’s hearing in a courtroom with wood paneling from floor to ceiling at the Houston federal courthouse, Judge Jennifer Walker Elrod urged Howard to focus on the 2005 memo on Northrop’s estimated cost to complete the contract. “This memorandum of understanding is a key that unlocks everything and shows why it’s fraud?” Elrod, a President George W. Bush appointee, asked Howard. “Yes, your honor,” Howard said. Without Solomon’s discovery of the 2005 memo, the government would not have known Lockheed and Northrop were purposely overbilling it, Howard said. “They didn’t even think it was an issue worth keeping the audit going,” Howard told the panel. “What do you say to that?” he asked. Howard stuck to his argument. “It is not reasonable to believe that a fraud investigator based on simple noncompliance would jump to the conclusion that this is through fraud,” he said. Lockheed Martin’s outside counsel, Michael Bronson with Dinsmore & Shohl in Cincinnati, turned the panel’s attention back to the government reports that he said undermine the “direct and independent knowledge” of fraud against the government that whistleblowers need to prevail in False Claims Act lawsuits. Bronson said that in Solomon’s lawsuit and an amended complaint, Solomon cites or relies on the Government Accountability Office and DCMA’s reports 25 times. “Mr. Solomon can’t possibly suggest that the DCMA report and GAO report don’t deal with at least some of his allegations in this case, those are the same documents he cites in his own complaint in support of his own claims,” Bronson said. Rounded out by 96-year-old Judge Thomas Reavley – a President Jimmy Carter appointee who did not speak during the 45-minute hearing, but did make some remarks during other hearings earlier in the day – the Fifth Circuit panel did not say when they would rule on the case. The Pentagon and Lockheed said on Nov. 1 that they had stopped shipments of the F-35 fighter jets from Sept. 21 to Oct. 20 after the company discovered “corrosion exceeding technical limits” at fastening points on the jets, Reuters reported. The Pentagon told Reuters the corrosion was not a flight-grounding safety concern and Lockheed did not halt production. It said it still plans to accept delivery of 66 of the jets this year. Led by CEO Marillyn Hewson since January 2013, Lockheed Martin is one of only 26 companies run by women on the S&P 500 U.S. stock market index.